Tongol tuna are caught by unassociated purse seines, gillnets, and troll and pole fisheries in the Indian Ocean as well as the Western and Central Pacific Ocean (WCPO). In 2011, purse seiners caught a record amount of tongol tunas in the Indian Ocean at 165,100 tonnes. Iran catches almost half of the tongol tuna in the Indian Ocean mostly using gillnets. In the WCPO, Indonesia catches the most tongol tunas. In 2011, Indonesia caught 79,198 tonnes. Tongol tuna is found in the US as a canned product, mostly imported from Thailand. Tongol tuna have a high age at maturity, a long lifespan, and other-life history characteristics which give this species a medium inherent vulnerability to fishing. In the WCPO, no stock assessments have been conducted, thus population status and fishing mortality is unknown. This is a moderate concern. The management body responsible for management of all tuna in the western Pacific Ocean is the Western and Central Pacific Fisheries Commission (WCPFC). Unlike other tuna species, the WCPFC does not manage tongol tuna. Thus management is left to individual countries. Unassociated purse seiners catch non-target species, although at a much lower rate than purse seines that use fish aggregating devices (FADs). Nonetheless, the unassociated purse seine fleets are still known to occasionally catch other neritic species such as kawakawa and frigate tunas. Baitfish are used in troll and pole fisheries, although the ratio of tuna to baitfish is approximately 30:1. Baitfish species make up only a small proportion of the total fishing mortality of the baitfish species. Unassociated purse seine sets and trolls/poles do not make contact with the ocean floor and therefore cause minimal habitat damage. However, in removing large quantities of high trophic level species such as tunas and sharks, these fisheries could potentially influence large changes to the structure and function of the ecosystem in the future. Tongol tuna are caught by unassociated purse seines, gillnets, and troll and pole fisheries in the Indian Ocean as well as the Western and Central Pacific Ocean (WCPO). In 2011, purse seiners caught a record amount of tongol tunas in the Indian Ocean at 165,100 tonnes. Iran catches almost half of the tongol tuna in the Indian Ocean mostly using gillnets. In the WCPO, Indonesia catches the most tongol tunas. In 2011, Indonesia caught 79,198 tonnes. Tongol tuna is found in the US as a canned product, mostly imported from Thailand. Tongol tuna have a high age at maturity, a long lifespan, and other-life history characteristics which give this species a medium inherent vulnerability to fishing. According to the latest assessment performed on the Indian Ocean population, the Indian Ocean tongol tuna stock is currently healthy although fishing pressure is too high. In the WCPO, no stock assessments have been conducted, thus population status and fishing mortality is unknown. This is a moderate concern. The management body responsible for the management of all tuna in the Indian Ocean is the Indian Ocean Tuna Committee (IOTC). Regular stock assessments are performed, and catch limits and spatial closures have been set up for bigeye in recent years. The IOTC also has management measures in place specific to purse seine fisheries. Countries had to submit a FAD management plan to the Commission by the end of 2013. However, the information required for these plans does not need to be submitted until 2015. In addition, there are ongoing concerns of vessel non-compliance with regulations, and improper catch reporting by member fishing countries is also a common occurrence. The management body responsible for management of all tuna in the western Pacific Ocean is the Western and Central Pacific Fisheries Commission (WCPFC). 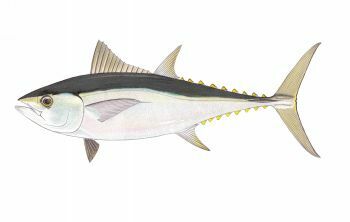 Unlike other tuna species, the WCPFC does not manage tongol tuna. Thus management is left to individual countries. Unassociated purse seiners and gillnets catch non-target species, although at a much lower rate than purse seines that use fish aggregating devices (FADs). Nonetheless, the unassociated purse seine and gillnet fleets are still known to occasionally catch other neritic species such as kawakawa and frigate tunas. Gillnets may also catch sharks. The exact amount of bycatch caught is unknown as reporting is poor. Unassociated purse seines, gillnets, driftnets, trolls, and poles have no negative impacts on bottom habitat as they do not come into contact with the seafloor. However, in removing large quantities of high trophic level species such as tunas and sharks, these fisheries could potentially influence large changes to the structure and function of the ecosystem in the future.